THE DAY you find yourself in Salvador, you’ll be too close to avoid the gravitational pull of the island paradise known as Morro de São Paulo. Not to be confused with the city I currently call home, Morro’s natural palm trees and emerald-green hills are the idyllic backdrop to its perfect sand and tranquil seas. Wheelbarrows supplant taxis, motorized vehicles are outlawed, and the aroma of moquecas, bobôs and fried seafood engrosses the ocean breeze. It’s a heavenly oasis, and an emphatic must-see if you’re in Brazil’s Nordeste. But before arriving at one of the most heavenly destinations in all of Brazil, you’ll have to experience a bit of hell. I’m not referring to the prominent crime rate in Salvador or the stomach-testing Baiano street treat, acarajé. I’m talking about the most common form of transportation to-and-from the island, the catamaran one of my students once branded “The Hell Boat”. Feared by most and respected by all, this is no ordinary catamaran ride. The infamous vessel departs the Salvador port a handful of times daily with Baianos and tourists alike packing the 90-to-100-seaters to capacity at $80BRL a head each way (soon moving to $90BRL). The boat powers through choppy waters and heads towards the island at full throttle, getting you to Morro in about 2 hours when the seas are calm or 3+ hours if they need to navigate around the nasty stuff. The latter is where “The Hell Boat” earns its rep, as rough waters usually translate to dozens of seasick passengers, so much so that there are courtesy puke bags already tied to the headrest in front of you when you board. On this particular day, the forecast was for the latter. I’d flown up for the weekend at Nicolly’s request, on the tail-end of her two-week Bahia trip. 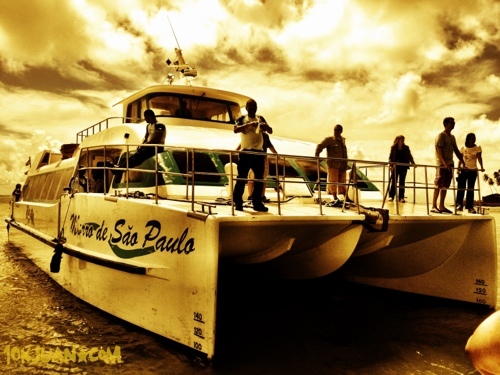 We’d decided to spend Friday in Salvador and venture off to Morro for a two-day quickie. She was genuinely concerned about the catamaran however, as she had heard the horror stories from fellow backpackers. Having never been sick on a boat though, and born with the ability of reading a whole Kindle Single in the backseat of a moving car or bus without a hint of a headache, I was only mildly concerned ahead of our voyage. As the passengers filed in and rushed to get the outside seats and window seats, there were smiles all around. And why not? Paradise was just a couple of hours away. As the boat set off at 9 that morning, it didn’t take long for the mood on the boat to sour. Conversations became intermittent and began tailing off altogether until the only audible sound on board was the crash of the waves on the front deck. The catamaran, doing its best buoy impersonation, swayed from left to right like the pendulum of a grandfather clock, with window views alternating between the dark blue of the sea, and the baby blue of the sky. After a few particularly rough waves splashed a notable amount of water inside and just short of everyone’s luggage, the doors leading out to the front deck were shut, cutting off the circular flow of air, and sealing 90% of the passengers’ fates. I tried not to look at the vomit bags thinking it would only trigger the urge to splurge, so I distracted myself by peering around the boat. Little kids began to sob. Not in that hysterical, “but-I-want-HIS-toy” type of rage, but a more dejected and defeated cry. I noticed some people down my row start to thumb at the knotted bags in front of them. Then Nicolly’s breaths got slower and deeper. Attempting to convince herself she could tough it out, she asked me the time twice in the first 25 minutes of the ride. I couldn’t bring myself to lie. There were over 2 hours left. This wasn’t the answer she’d hoped for. The tension was building. This wasn’t going to end well. Terror was now at the helm. And then it happened. The 7-year-old one row behind me and two seats to the left popped, splashing her breakfast neatly into her free bag. What followed is one of the most vivid moments of my weekend in the Nordeste. Passengers started upchucking left and right. Plastic bags turned into water balloon-esque spit buckets. The smell of stomach acid consumed the cabin, aided in part by the maracuja and oranges most people had drunk for breakfast. Nicolly caved shortly after. I held her hair the same way I’d held several girlfriends’ hairs in college after one too many Cuervo shots. Kids threw up right onto the floor, too sick to coordinate the opening of their bag before yakking their misto quente. The vomit had gone viral. As the pukefest threatened to turn into a pandemic, the crew hands, who had been on high alert from the onset, went into action, eyeballing everyone with plastic bags in hand, pressing forward on their toes and pouncing at the first sign of a seasick passenger. Having experienced their work for several hours, I have no doubt they are the most efficient workers in all of Salvador/Morro. Vomit Retrieval Specialist? Puke Processor? Whatever his title is, it’s well-earned. Calm, cool and collected, they attended dozens of passengers methodically. As the boat continued to rock back and forth, they had to balance their way to the trash outside with the concentration of a Cirque du Soleil performer. The 10,000-Hour Rule may have been in effect. It was masterful. 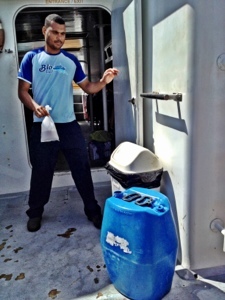 They’re the guardian angels of the journey, the naval heroes of the Nordeste, keeping the cabins puke-free while putting your crappy job, and probably the rest of your life, in perspective. After the first hour and a half, most seasick-prone passengers had emptied their chambers and passed out, Nicolly included. I heard a few moans and sighs now and then, but the damage had been done. The Hell Boat had proven its worth and beaten the island-bound group into submission. I’d survived with little more than a slight headache, though I’d had to stop reading at one point to avoid feeling worse. As Morro became visible on the horizon, I exited the cabin for an unobstructed view. It was more than I could’ve ever imagined. A picture-perfect day amidst a bouquet of bile. At the very least, the hellish ride would most certainly be the weekend’s low point for the affected passengers. After 3 grueling hours at sea, we had finally arrived at paradise. Servicing seasick passengers? Not a problem for our happy hurler helpers. 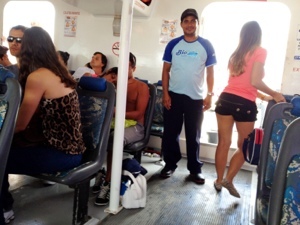 It’s worth mentioning that there is an alternate route from Salvador to Morro that adds ferries and buses to the journey. It lasts 2-3 hours more and is supposedly much friendlier for those prone to seasickness. So brave the catamaran. Live a little. Test your intestinal fortitude. 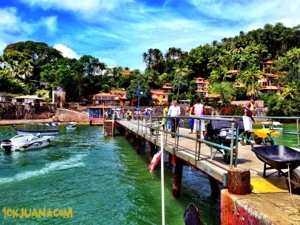 And soak up the delectable paradise that is Morro de São Paulo. But just to be safe, pack some Dramamine. Would you ride the hellish catamaran? What’s the worst boat ride you’ve ever been on? I loved this post, and I hope the guys on ‘vomit collecting’ duty get paid A LOT! Thanks Andrew, was thinking the same. It doesn’t get much lower than that. Maybe gentleman’s club janitor, like Bud in Kill Bill Vol.2. Those are duking it out for worst job ever. Thanks for reading! Thanks Mikey! Yeah, you do get sluggish after awhile. Happened to me once they closed the door. Secret is to sit outside actually. Thanks for reading! Juan, congrats! This is the perfect description of the Hell Boat! It’s a once in a life time experience! 2 hours of vomit and years of laughs remembering the situation! I had the same sort of experience on a hyrofoil linking Tangier to Gibraltar in 1988. Sitting with 300 or so passengers in a seastorm, it amazed me that there actually were a handful that did not throw up. I was definitely swept away by the contagious sounds. I wish I had recorded the symphony of barfing that went on for two hours. I could throw it on my stereo and crank up the volume in order to get my neighbors in Sao Paulo to end their late night churrascos before 3 a.m. This sounds so much like my first ever boat trip :) It was a large wooden boat designed for seavirgin tourists like myself. As soon as the horizon started to go uuuuup and then doooown … the only thing I cared about was to have a plastic bag in my hand all the time :) I laught at it now as well, but I wasnt too happy while on the boat. I’m scared stiff of the sea so I never go on boats! I must admit your blog is very interesting. Found you via expats blog.